She couldn't understand how life could be moving around her. How was everything so normal.? Why wasn't everyone else's like ending just like hers.? The rain was soaking her soul this time. The dress she wore was losing its opacity . It didn't matter , she felt ripped anyway. The same rain she once loved had taken something away from her.The smell of wet mud that once engulfed her senses was just some sort of bad stink now. 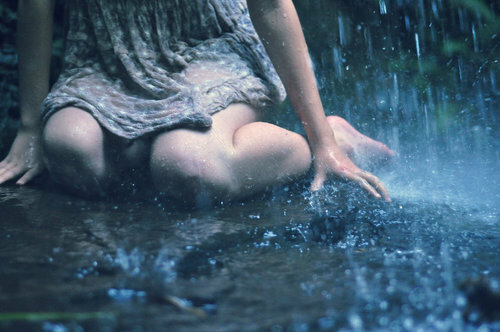 She didn't want to lift her hands and feel the rain anymore. It scared her , reminded her of the loss. The monsoon just brought back those memories. It broke her strong pretentious wall , she wasn't that strong. She missed him . Even after all these years she missed him. Everytime it was raining like it would flood for days it brought back that hollow feeling. She wished she was with him that day. She wished he was not alone . Maybe he would have been more cautious that way. He would not see her graduate. He would not be there on her wedding day.He would not be there to see how she was becoming just like him , all the little things and mannerisms that reminded everyone of him. He would never wish her on her birthday again. He was always the first to call. He would not be smiling with tears filling his eyes at all her accomplishments. He wouldn't be there on the family holidays. He was not going to be there watching out for her. He was not going to be there to take care of her. He's watching her from up there though. Somehow his light always shines upon her even now. As for the rain. She hates it and always will. I'll write too. April is a crazy month. So,I won't be regular but I WILL write. This picture made me think of a post I wrote a long long time back..